I haven't written any music reviews for this website, because I'm not sure how you manage to convince someone of musical value through words. I used to devour music reviews in college until I realized that there was virtually no connection between how intelligent the reviewers seemed and whether their judgments ended up lining up with mine. So I stopped reading them. Now I look at the occasional interview with a musician I already like, or wait for recommendations from friends. So I want to apologize for subjecting you to a music review. Because I'm going to attempt to convince you that Ron Sexsmith is a great artist, knowing in advance that there's no way I can do this with words. I only bother because it seems like very few people know about him. Sexsmith has released ten albums over the last decade and a half and keeps getting bounced from one label to another. Several of his old albums are no longer available, although you can usually find them used. On first listen, his music does not seem like a particularly specialized taste, one that needs to be defended against philistines. It sounds, quite frequently, like soft rock, suitable for waiting rooms and supermarkets. His melodies are rarely immediately catchy, and he also avoids jarring dissonances, both in his singing and his instrumentation. His tempos are generally loping, with drumming that stays very much in the background. Very rarely will you find yourself tapping a toe. In short, Sexsmith never insists that you pay attention to him. His music only opens up on repeated listens, where the listener is actually focusing – on the lyrics, the melody, the structure of a song. Unfortunately, the segment of the population that tends to be serious about popular music is likely to be put off both by the "unchallenging" surface pleasantness of Sexsmith's music and the content of his lyrics, which are often both coherent and hopeful. Sexsmith tells stories, he relates morals, and even occasionally declares his faith. He has a song called "God Loves Everyone," and the lyrics, unashamedly and without irony, say just that. And although I don't believe this and I'm pretty sure it's not true, I believe the song. I'm willing to follow it past what I can reasonably defend. The point of music – or at least one of them – is to take us beyond the realm of the intellectually defensible, a realm that most people find exhausting now and then. So we sent up prayers and trouble deaf heaven with our cries – and the more beautiful we can make these cries, the higher up they get before they disappear. Which in my experience they eventually do. I'm only willing to follow them up, of course, when I'm convinced that a musician isn't insincere or simply muddleheaded. But Sexsmith's lyrics are exceptionally smart and always leavened by doubt. His version of God in the afore-mentioned song, in any case, is a strange and abstract entity, clearly worked out in his mind independent of any organized religion. "The heart runs on faith / the mind on proof," he sings in "Poor Helpless Dreams," and Sexsmith never completely loses himself in one or the other. His love songs always acknowledge the possibility of disaster, even with the best of wills; and his songs of faith and affirmation make it clear that these are simply prayers, and do not reflect the world as it generally stands. The only source of happiness that Sexsmith reliably returns to is the lost paradise of childhood. And if he occasionally gets sentimental, which he does, I am also moved by his music in a way that I'm not by even the best modern songwriters. Songs like "Seem to Recall" reach down into a place that few pieces of music have ever accessed for me. An example: the song "Traveling Alone" starts with an image of a man getting on a train, and uses the words of the Christian marriage ceremony to signify our union not with another person, but with private obsessions: "From the dreams at hand there's no divorce / In sickness and in health / It's a fever that must run its course / Before you are well." And the song ends with a simple but beautiful metaphor for fundamental human isolation. Is this great poetry? Maybe not, but it is a great set of song lyrics, and their impact on me partly depends on the melody that I hear as I write them out. I sat down once with my guitar to figure out how to play "One Less Shadow" - another great Ron song - and after a fair amount of time I got it mostly right and realized how strange and inspired Sexsmith's progressions are. By way of contrast, when I sit down at the keyboard to goof around, it is easy for me to plonk my way into discovering something that sounds okay, like it "could be a song." The hands finds their way to ordinary chords and try out variations on old tunes. I'm fairly certain that most songs, and even some great ones, are written this way - composed at the piano or the guitar basically using trial and error. But when I play an inspired melody like "Here, There, and Everywhere," the chords don't run in the usual grooves; they're twisted and idiosyncratic, even while the tune seems as inevitable as C to F. The artist has clearly worked out the song and cast it into shape in his imagination. I'm sure there's plenty of tweaking left to do, but the heart of the song is coming from inspiration and not from someone's fingers chancing on a tune. I always feel this deeper inspiration with Sexsmith's best songs; they are simply beyond accident, beyond the range of musical dabblers like me. There are a few caveats. Sexsmith doesn't seem particularly devoted to the production part of his music; once he gets the song right, he leaves the ornamentation and basic sound to other people who don't always serve him well. So there are some production disasters on his albums: the backing singers on "These Days," the bizarre tuba breakdown on "At Different Times," and any number of schmaltzy arrangements (no one seems to be able to entirely wreck the songs, though, and Sexsmith's versions are always the best). Also, while every one of his albums is worth owning, I don't think a single one is flawless; at least a handful of songs usually don't connect with me. The current one, though, Exit Strategy of the Soul, is very good, and well-produced. Like his other albums, on first listen I regretted buying it; three or four listens later I realized my mistake. 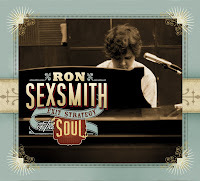 The album contributes another five or six great songs to the dozens Sexsmith has written over the last decade and a half, a period of productivity that is astonishing considering how quickly most great musical talents fizzle out. I once had a stack of his CDs on my office desk, and a colleague assumed – because of Sexsmith's last name and the pictures of the slightly chubby man on all the covers – that this was music of the most extraordinary depravity. (I can't imagine what would have happened if I'd had some Bruce Cockburn albums mixed in.) But one of the amazing things about Sexsmith is that he is writing healthy, wise, inventive songs in times that don't seem to deserve them. Musical talent, as far as I can tell, is handed out at random, and most of the time it's given to people with almost nothing to say. So we should pay attention when it happens to be granted to someone with intelligence and insight, because it is a rare gift. Update: I managed to see Sexsmith in Cambridge with about twenty other people. In his words, it was a "small but mighty audience." Almost everything promised a bad night. Sexsmith's drummer had bailed on them earlier in the tour, so it was just him and a bassist. Some of the crowd had come for one of the earlier, local acts, so they were milling around by the bar without really listening. And there was another band playing in the basement whose bass would vibrate through the floor in the middle of Sexsmith's songs, which was extremely annoying. I was starting to feel bad until Ron got a few songs into his set, and then, during "All in Good Time," everyone in front of the stage started singing along. The dozen or so of us knew all the lyrics, and not just to that song. Looking around, it was obvious that there was profound devotion in this little group, which I hope was worth something to him. He seems to be pretty satisfied with what he's doing, in any case. As for the show, Sexsmith was really good. The songs sounded a lot like they do on the records, although with some creative and unobtrusively brilliant guitar work to fill in for the missing instruments. I really recommend picking up one of his albums (his latest is very good) -- I can't think of another artist working today that engages me intensely in so many different ways. I think you have written a very good piece that accurately identifies Ron's talent. Only wish I'd known about Ron years before got to see a documentary (Love Shines) on tv. He deserves much more acclaim than he gets!